This toy was bought by the Museum for the exhibition 'Must Have Toys' in 2004. The exhibition was about the most popular toys from the last 100 years. The exhibition was shown at the V&A Museum of Childhood and then it went on to tour the UK. This toy won the Toy Retailers Association's Toy of the Year award in 1978. The awards started in 1965 and are highly regarded in the toy industry. However, compared to other years this one seems to have been an unusual winner. It may have had something to do with the popularity of The Worzels chart topping song two years earlier, The Combine Harvester, which was a hit with young children. 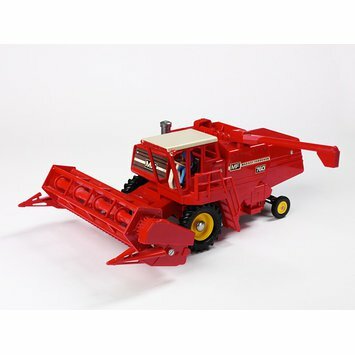 Red plastic combine harvester modelled on a real one of the time. The vehicle is red all over with a red funnel that is hinged at the top, which is moveable. It has a silver chimney on the top next to the cabin, turning this causes the rear wheels to change direction. The cabin has a white roof, seat and steering wheel, and a figure of a farmer dressed in blue overalls sitting in the seat. On both sides is a label reading 'MF Massey Ferguson, 760' in white and black text. On the front and back are the letters 'MF'. The wheels are black rubber with yellow plastic centres. 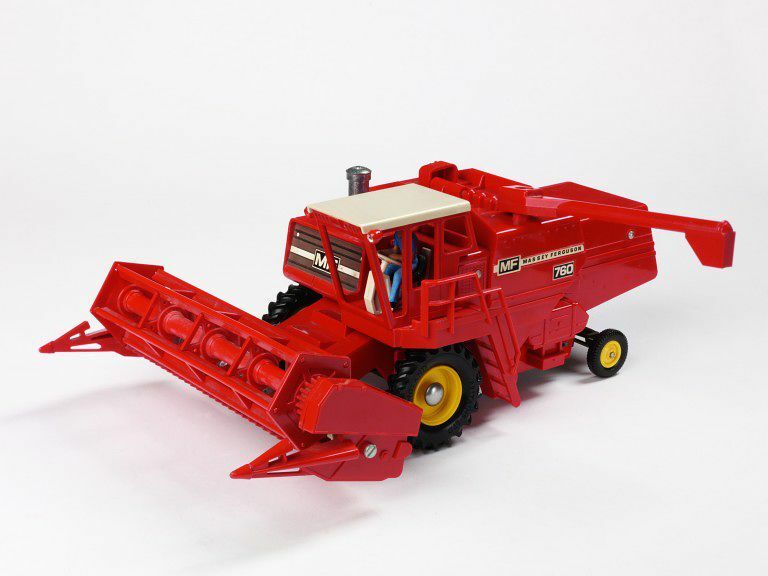 Combine harvester, red plastic, 'MF Massey Ferguson, 760', made by Britains Ltd, England, 1978. Metal toy made by Britain's in 1978.